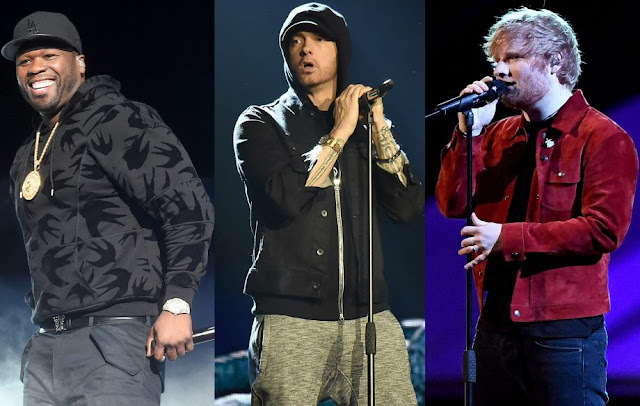 Rapper 50 Cent has revealed that he is working on a new collaboration with Eminem and Ed Sheeran. Earlier this year, 50 Cent hinted that he was working on new music with Eminem. The rappers have collaborated several times in the past but haven’t worked together since 2012’s ‘My Life’, which also featured Maroon 5‘s Adam Levine. During his Twickenham Stadium show earlier this year, Eminem invited both 50 Cent and Sheeran on stage, taking a selfie of the occasion that went viral. “Thank you @edsheeran and @50cent for joining my collection of legendary selfies,” the rapper wrote on Twitter (July 15). While this is 50 Cent’s first collaboration with Sheeran, Eminem has worked with him previously on the ‘Revival’ song ‘River’. No details have been revealed as of yet about the release of the upcoming collaboration. Earlier this year, 50 told The New York Times that he was “in the middle of recording my sixth album” and compared it to his debut ‘Get Rich or Die Trying’. “It’s as thrilling as my first,” he told the newspaper.